The study of photon interaction with different composite materials has become a topic of prime importance for radiation physicists. Some parameters of dosimetric interest are the mass attenuation coefficient, effective atomic number, and electron density; these help in the basic understanding of photon interactions with composite materials. The mass attenuation coefficient (μ/ρ) is a measure of the number of photons interacting (scattered/absorbed) with the target material. It is the fundamental tool to derive many other parameters of dosimetric interest such as mass energy absorption coefficient, molecular, atomic and electronic cross sections, effective atomic number, and electron density. For about 100 elements, the mass attenuation coefficient data are compiled in the form of the software package WinXCom,  whereas work is still in progress to find the mass attenuation coefficients of composite materials. For a complex medium, the ''effective atomic number'' is in some cases a convenient parameter for representing X-ray and gamma ray interactions, for example, in designs of radiation shielding or in calculations of absorbed dose. This number is very useful in choosing a substitute composite material in place of an element for a given energy depending on the requirement. The effective atomic number of a multielement material is not a constant (Hine  ). It is varying with photon energy, depending on the relative importance of the interaction processes involved. The effective atomic number is calculated from the atomic numbers of the constituent elements, weighted according to the different partial interaction process by which the photon interacts, and hence it is an energy dependent parameter. It signifies that, at a given energy, a composite material would interact with photons in the similar way as a single element of atomic number equivalent to that composite material. The effective electron number or electron density (N el) is also very useful in choosing a substitute composite material in place of an element for that energy depending on the requirement. 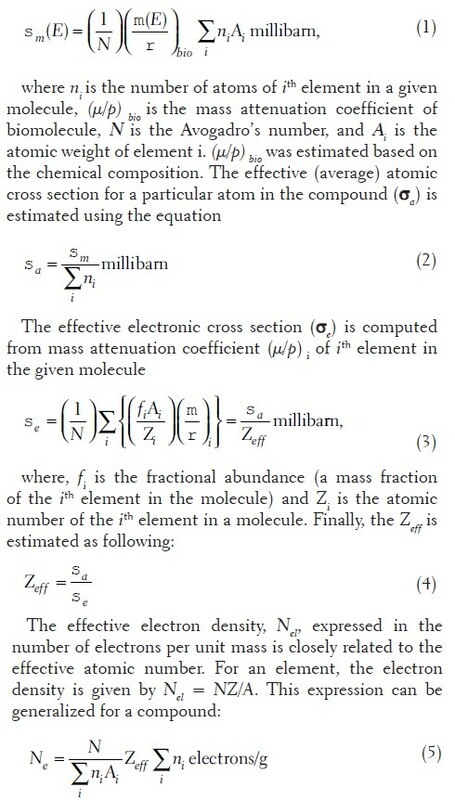 The energy absorption in the given medium can be calculated by means of well-established formulae if certain constants such as Z eff and N el of the medium are known. In fact, these values can provide an initial estimation of the chemical composition of the material. Hence in the present study, it has been evaluated the photon interaction parameters such as (μ/ρ), Z eff, and N el of 13 lung tissue substitutes were evaluated. The reference lung material was the healthy adult lung tissue listed in ICRU-44  and ICRP-89,  referred here as ICRU-44 lung tissue. The lung tissue substitutes investigated included that developed by Griffith et al., designated Grif-G, a second lung tissue substitute developed at Lawrence Livermore National Laboratory, designated LLLL1,  ALT2,  the Alderson Lung material,  LN1,  LN10/75,  MS20/L,  LTES,  LN300,  and an unnamed material designated here as SK-LNG. Two additional tissue substitutes, A150 and M3,  were included. In the present work, N el and Z eff for the tissue substitutes of Lung were evaluated using equation (4) and (5). The computed mass attenuation coefficients, Z eff and N el of lung tissue substitutes, are shown in [Figure 1], [Figure 2], [Figure 3]. 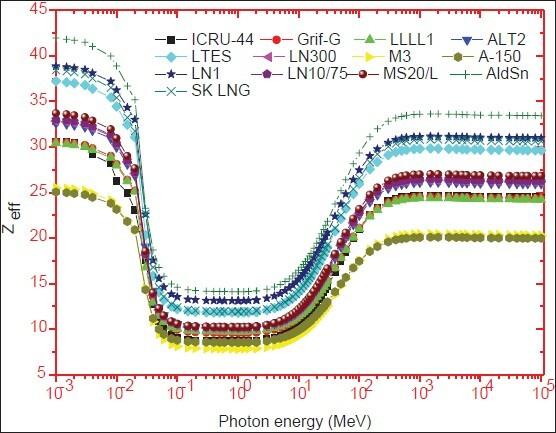 The variation of Z eff and N el is dominated by of different photon interactions. The variation of photon interaction parameters of the studied lung tissue substitutes is similar that of the lung. 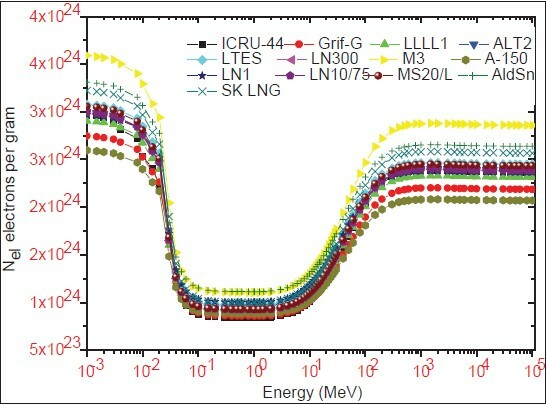 In the lower energy region, photo electric interaction dominates and Z eff varies similar to photo electric absorption. There is a slight increase in the Z eff up to few keV and becomes maximum then decreases sharply, showing that contribution of scattering processes increases which decreases Z eff. This is also confirmed by previous author,  who confirmed that Z eff of composite material for photoelectric interaction is greater than other processes. It remains constant from 0.2 to 2 MeV which shows that coherent and incoherent processes increases. 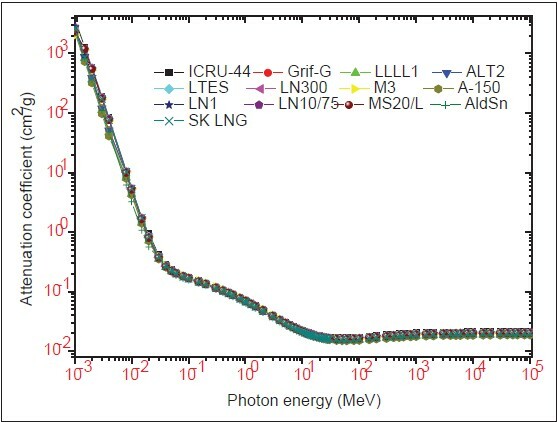 From 2 to300 MeV, there is regular increase in the Z eff with photon energy. This is due to the increase in incoherent and pair production processes. From 300 MeV onward Z eff remains constant which is due to dominance in pair production processes.Z eff values vary due to different elemental composition. The variation of N el with photon energy is also similar that of the Z eff. Various procedures can be applied to the simulation of body tissues. The "effective atomic number (Z) method" is applicable to simulte the tissue substitutes for photon interactions. In this method, the effective atomic number, mass attenuation coefficient, energy absorption coefficient, and kerma value of tissue substitutes are compared with their original tissues. The ratios of mass attenuation coefficient, effective atomic number, and effective electron density between the lung and their substitutes are given in the [Table 1], [Table 2], [Table 3]. These ratios are almost equal to one for Alderson lung compared with other substitutes. So that logically it can be concluded that the Alderson lung seems to be a good substitute for lung than the other substitutes. Hence, the computed values are useful in the simulation of tissue substitutes. The mass attenuation coefficient, electron mass stopping power, mass angular scattering power, mass stopping power, and kerma factors must be identical for the tissue substitutes. Also, if equal masses of two materials are to have the same volume, then the mass densities of the two must be the same. It is obvious that the above can only be achieved if the material is made to have the same elemental constituents and in the same proportion by weight as the real tissue; it is only for such materials that the term "tissue equivalent" should be used. The photon interaction parameters like (μ/ρ), Z eff, and N el gives the information about the elemental constituents and their proportion in the material. Hence, the present work is useful in the simulation of tissue substitutes. 1. Gerward L, Guilbert N, Jensen KB, Levring H. WinXCom- A program for calculating X-ray attenuation coefficients. Rad Phys Chem 2004;71:653-4. 2. Hine GJ. The effective atomic number of material for various g interaction. Phys Rev 1985;85:725-30. 3. ICRU. Tissue substitutes in radiation dosimetry and measurement Report 44 [Last accessed on 1989]. 4. Basic anatomical and physiological data for use in radiological protection: Reference values. A report of age- and gender-related differences in the anatomical and physiological characteristics of reference individuals. ICRP Publication 89. Ann ICRP 2002;32:5-265. 5. Griffith RV, Dean PN, Anderson AL, Fisher JC. A tissue-equivalent torso phantom for intercalibration of in-vivo transuranic-nuclide counting facilities. Proceedings of the IAEA: International Symposium on Advances in Radiation Protection Monitoring, Stockholm; 1978. IAEA-SM-229/56:493-504. 6. Taylor FY. History of the lawrence livermore national laboratory torso phantom. master of science thesis, san jose state university. Available from UMI Dissertation Services, Ann Arbor, MI [Last accessed on 1997]. 7. Traub RJ, Olsen PC, McDonald JC. The radiological properties of a novel lung tissue substitute. Radiat Prot Dosim 2006;121:202-7. 8. Fry FA, Summerling TJ. The design and construction of a realistic thorax phantom for in vivo measurements of low-energy photon emitters. Phys Med Biol 1982;27:1367-79. 9. Traub RJ. Influence of manufacturing processes on the performance of phantom lungs, pacific northwest national laboratory richland; 2008, Washington 99352, PNNL17852. 10. Kinase S, Kimura M, Noguchi H, Yokoyama S. Development of lung and soft tissue substitutes for photons. Radiat Prot Dosim 2005;115:248-8. 11. Manjunathaguru V, Umesh TK. Total interaction cross sections and effective atomic numbers of some biologically important compounds containing H, C, N and O in the energy range 64-136 keV. J Phys B At Mol Opt Phys 2007;40:3707-18. 12. Constantinou C. Tissue substitutes for particulate radiations and their use in radiation dosimetry and radiotherapy, Ph.D. thesis, University of London; 1978.